Simplify your messaging and send email and SMS directly from one secure gateway. Using one platform you can send secure SMS, voice messages, push notifications, emails amongst others all from the comfort of your browser. Using address mapping or a specially formatted email address, you can send SMS messages to anyone in your existing contact list. Create a new email to SMS rule in Whispir by defining your originating email domain and a ‘token’ inbound email address like info@whispir.com. Try Whispir's email to SMS with a 14 day free trial - no credit card needed! SMS responses can be configured to automatically allocate to your email. Simply reply to that email to keep the conversation flowing. SMS helps your business cut through the noise and content overload people experience daily as well as increase the speed of notification when urgent communication is required. The Whispir Platform allows you to send bulk SMS via email when a single message isn’t enough. Just login securely from your browser or mobile and select the full list of recipients from your contacts. 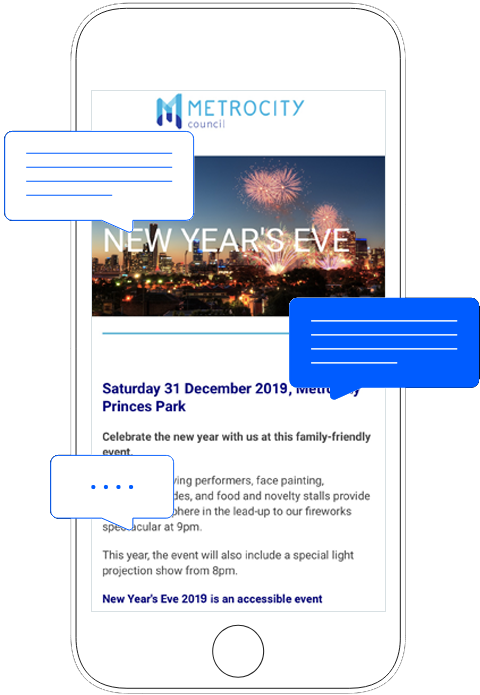 SMS has greater cut through than direct email and any other method of mobile communication, perfect for time-critical situations or events. SMS can be more secure than email, as it does not contain potentially hazardous attachments and is also not subject to spam filters. SMS does not require internet access and consequently can be very effective when 3G and 4G signals are not reliable.